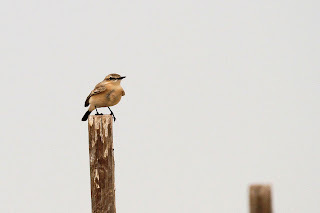 You already read about my Kuwait birding adventures. 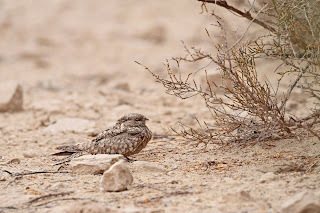 Birding in Kuwait was a no-brainer since Kuwait was our work destination but I figured that I should also take advantage of the trip to spend another day in the United Arab Emirates (UAE) since my flight had a layover there anyway. We started early and headed east toward the "mountains". And by mountains, I mean a few high elevation areas of bare rock that stick up from the desert. 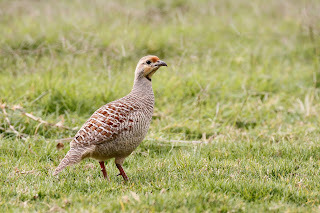 We hit paydirt right off the bat with a few new birds including Desert Larks, Water Pipits and Gray Francolins that were in the public park at the bottom of the mountain. They didn't seem to mind the picnicking families. And then I saw the Indian Roller - a bird that I have wanted to see since I first read about it in a magazine. 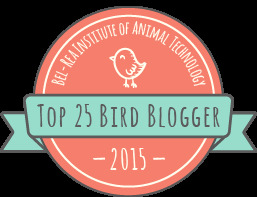 They are colorful birds that command respect. The day was overcast with light rain which is not ideal for finding birds (or lugging expensive cameras around) but we perservered and headed up a winding road to the top of the mountain where we found a few more target birds including this Sandgrouse sitting on a windy pinnacle. 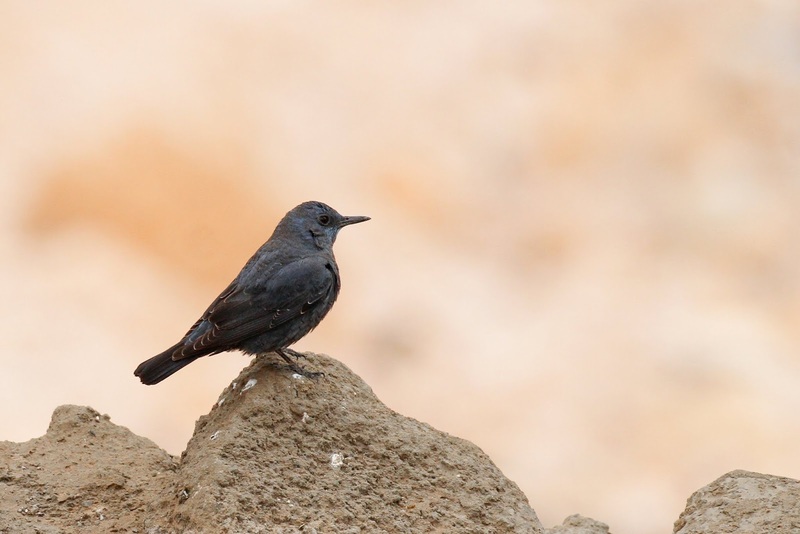 And this stunning Blue Rock Thrush. It's a "wow" bird for sure. There is a hotel at the top of the mountain complete with a pool and water slide. 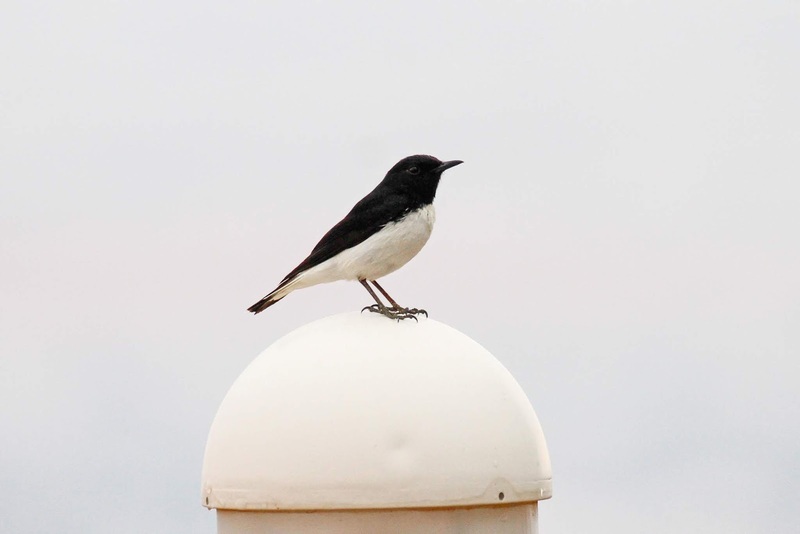 We found a few more birds hanging around the pool area including Hume's Wheatear sitting on a post. 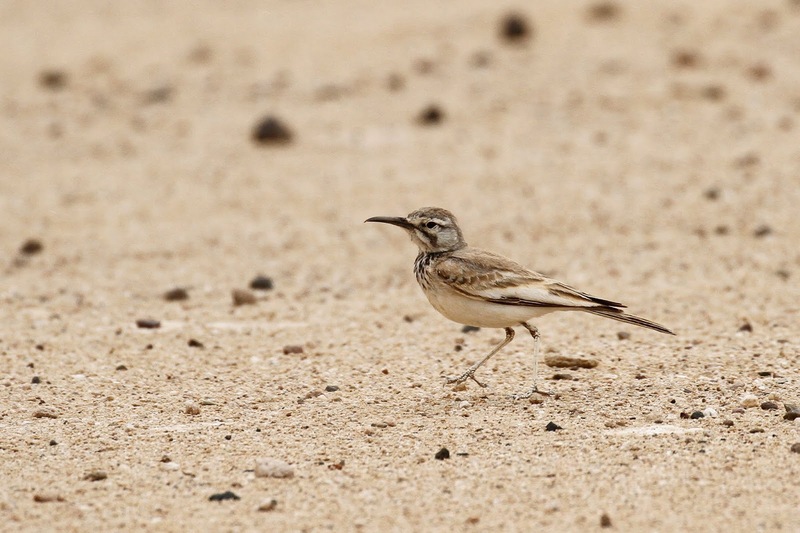 Our best desert find of the day was this Hoopoe Lark. 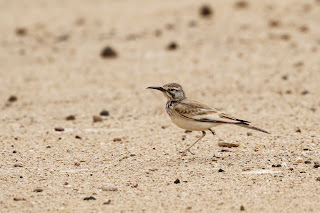 A true desert specialty that reminds me of a thrasher or roadrunner the way it scurries across the barren landscape. Oscar knew right where to go to find one and this guy put on a show. We also looked for lakes which naturally attract birds. We found a few good ones at the lake near the horse race track. 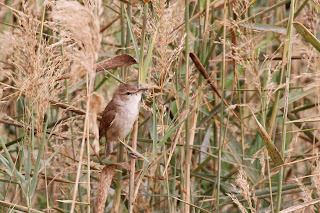 Clamorous Reed Warblers come by their name honestly - they are certainly clamorous. 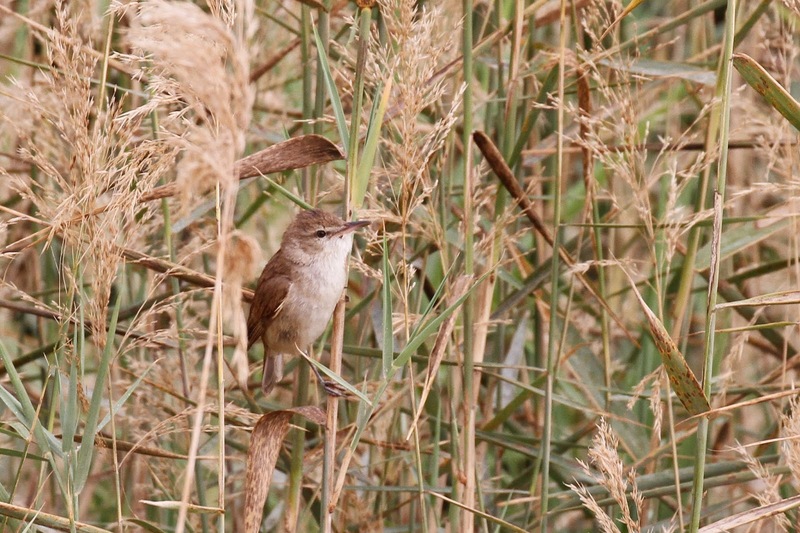 You often hear these loud birds but cannot see them hiding in the reeds right in front of you. It is maddening. Thankfully, this guy wasn't shy. He came right to the edge of the reeds and sang his heart out. Isabelline Wheatears are never shy. 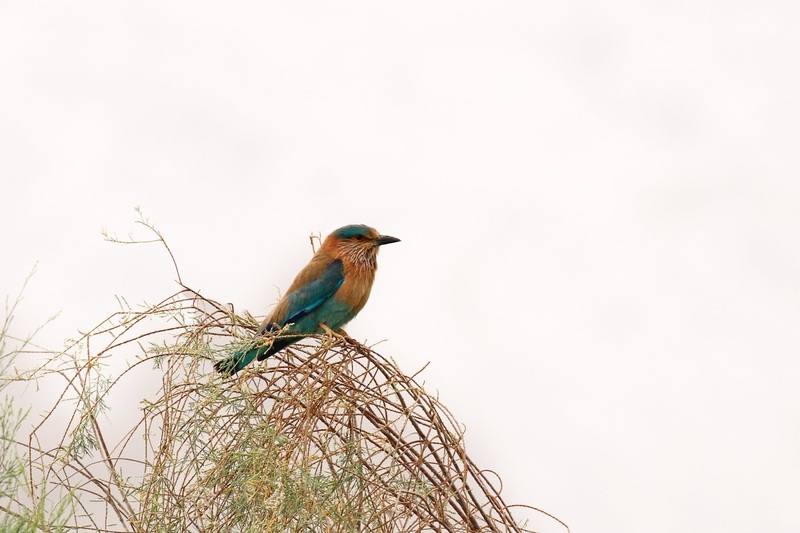 We saw many of these birds perched on top of posts or bushes in the desert. 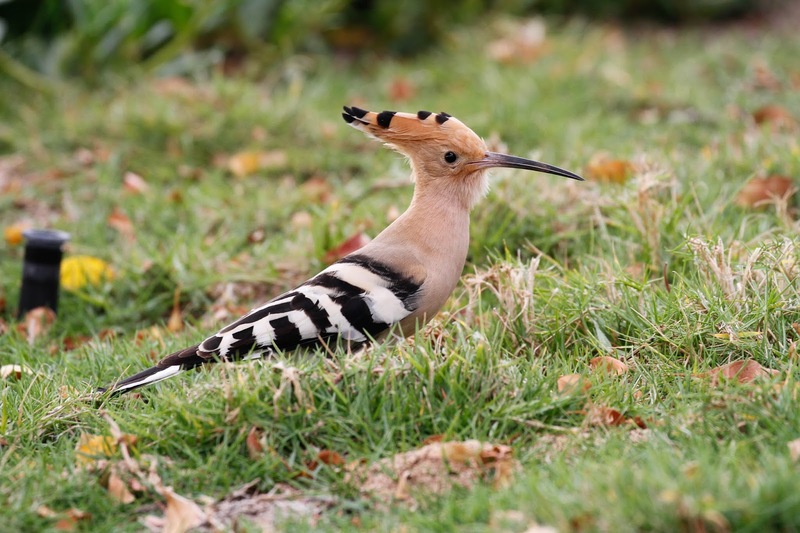 We often see other wildlife when birding but I never expected to see one of these! 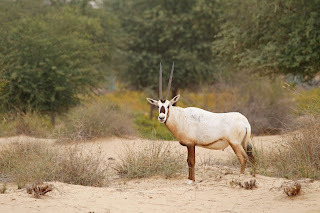 This is an Arabian Oryx. They were almost extinct from hunting. UAE has released some back into the desert after successful recovery program. I think the park people feed them to make sure of their success but it was still a pleasant surprise. We also caught a few glimpses of antelopes but they were too fast to catch with a photo. The only other desert animal that we found was this Desert Hare. 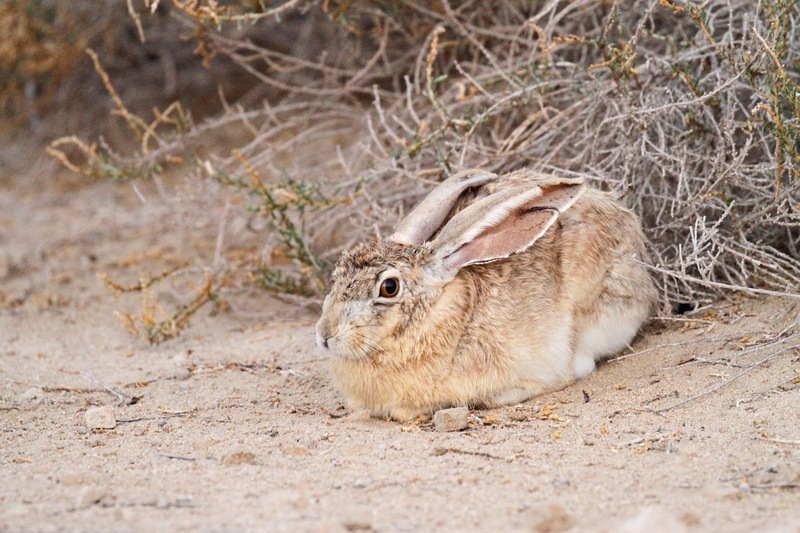 He sat perfectly still as we walked by confident in his camouflage. We ended the day on a high note by finding an Egyptian Nightjar. Oscar knows where they like to nest and had heard one singing a few days earlier. We arrived before sunset in hopes of hearing the bird but got even luckier when we spotted him moving through the desert between bushes. I was able to sneak up on him and snap a few decent photos. 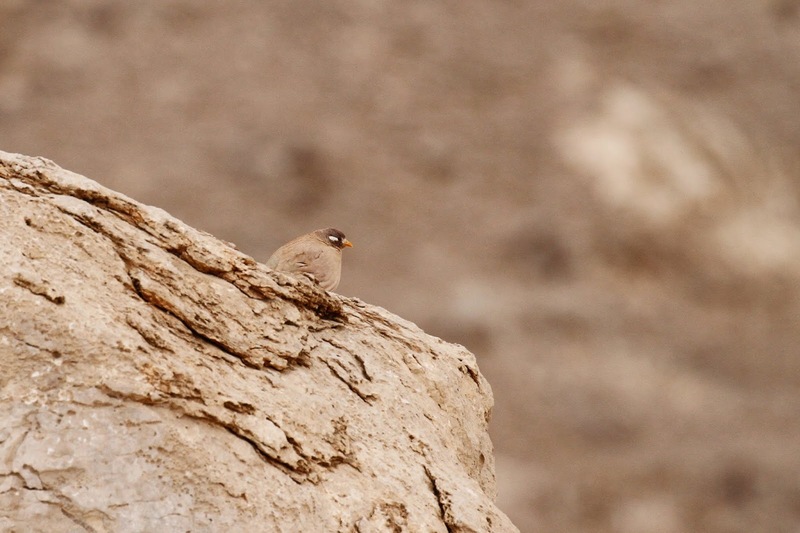 Another great day of birding in Arabia. I highly recommend getting into the desert to see this amazing place.